I bought a car this past weekend from a BMW dealership in Scottsdale, AZ. Now, I wasn't purchasing a brand new BMW--I have a typical youth pastor's salary. I was buying a used Honda CR-V from their pre-owned cars. If you don't know anything about Scottsdale, it's like the O.C. of the Phoenix valley. Wealthy, image-driven, the kind of folks who drive enormous SUVs and pay thousands of dollars for exclusive golf memberships and plastic surgery. I recently heard from a friend that there isn't even a Goodwill in Scottsdale because the neighborhood fought to keep it from being built. After a long process of paperwork and figuring out car loans, the salesman helping me shook my hand and led me to my newly-purchased car. He thanked me for being patient--it had been a long day--and I returned the gratitude. "I'm probably not your typical BMW in Scottsdale customer," I admitted. He knew my salary and profession, as he had run a credit check an hour earlier. His response floored me: "We treat everyone the same here, no matter who they are when they walk in the door. Whether you're buying a $5000 car or a $100,000 car, we'll take care of you. "And they did. The entire staff was cordial, friendly, and willing to help with anything I needed, even when my toddler decided to throw the biggest public fit he's ever demonstrated. My brothers, show no partiality as you hold the faith in our Lord Jesus Christ, the Lord of glory. For if a man wearing a gold ring and fine clothing comes into your assembly, and a poor man in shabby clothing also comes in, and if you pay attention to the one who wears the fine clothing and say, “You sit here in a good place,” while you say to the poor man, “You stand over there,” or, “Sit down at my feet,” have you not then made distinctions among yourselves and become judges with evil thoughts? Listen, my beloved brothers, has not God chosen those who are poor in the world to be rich in faith and heirs of the kingdom, which he has promised to those who love him? But you have dishonored the poor man. Are not the rich the ones who oppress you, and the ones who drag you into court? Are they not the ones who blaspheme the honorable name by which you were called? If you really fulfill the royal law according to the Scripture, “You shall love your neighbor as yourself,” you are doing well. But if you show partiality, you are committing sin and are convicted by the law as transgressors. For whoever keeps the whole law but fails in one point has become accountable for all of it. For he who said, “Do not commit adultery,” also said, “Do not murder.” If you do not commit adultery but do murder, you have become a transgressor of the law. So speak and so act as those who are to be judged under the law of liberty. For judgment is without mercy to one who has shown no mercy. Mercy triumphs over judgment. There are all sorts of social divisions and boundaries we create. Whether it's gender, economic status, personality, politics, or a theological bent, we can find plenty of ways to keep ourselves from being with "those people." Yet if God took the same stance with sinful humanity, Jesus never would have come to earth and saved us from our brokenness. James makes it pointedly clear: if you show partiality and unfairly judge others, you are in sin. This isn't the kind of healthy judgment Paul is talking about in 1 Corinthians 5, where ongoing sin requires wise discipline and consequences. This is being judgmental, taking a stance against another for an unfair and unloving reason. 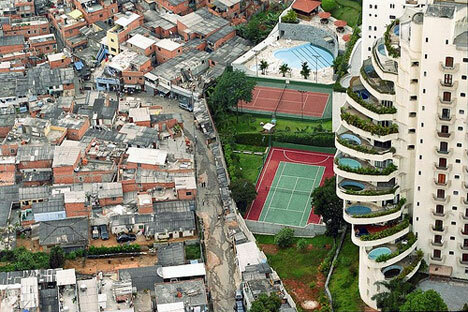 What if we could be known as people who break down dividing walls--literal ones, like in the picture of San Paulo, Brazil above; and spiritual ones, like the sin that keeps us from being reconciled? Show no partiality. Mercy triumphs over judgment. Love your neighbor as yourself. Who needs to experience the mercy and love of Christ through you today?